Pastor Kuhn was born in Baltimore, Md, on December 23, 1968. 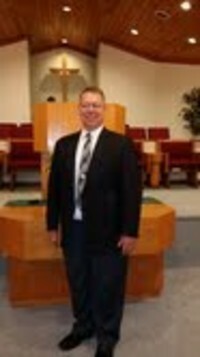 Upon graduating High School in 1986, Pastor Kuhn went into the US Army and stayed 20 years, retiring in October of 2006. He came to know the Savior on December 5, 1993, at the age of 25. Pastor Kuhn met his wife, Tracey, in 1988 and they were married August 12, 1989 in Smithville Flats, NY. The Kuhn’s have 4 children, Cassandra, Miranda, Rebekah, and Jacob. Cassandra is married to Caleb Smith and they are serving the Lord in California. Pastor Kuhn surrendered to preach the Gospel of Christ and in 2010 the Kuhn’s sold their house in Vestal, Ny and moved to Chesterton, Indiana to attend Fairhaven Baptist College. Pastor Kuhn graduated Fairhaven in May of 2014 and is now on staff here at our church serving as the Pastor.